The A & B Stories: ADOP /// A commissioned painting for Erin Loechner! ADOP /// A commissioned painting for Erin Loechner! Hello friends! I've actually been meaning to post about this for ages, but just haven't got around to it yet. The timing worked out well though! 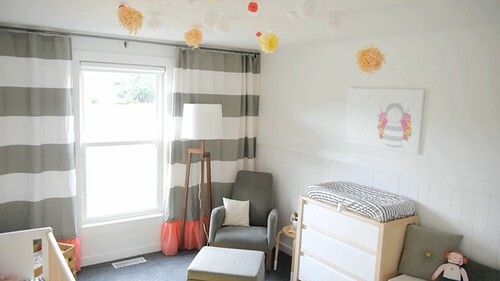 You may have already seen that the lovely Erin revealed her AMAZING nursery in this video tour...isn't it just fab? You may also have noticed a little painting there on the wall, one that I happened to paint for her! 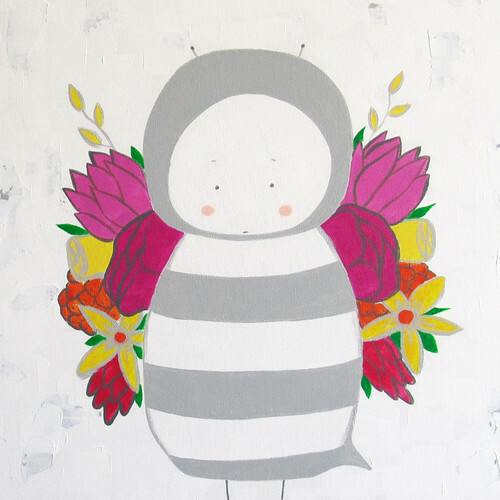 I was so, so excited to have the chance to create a painting for her little girl's room. I created a new character in my line of animals specifically for Erin, and added a little floral touch to compliment the rest of this amazing nursery space. I have to say, back when Erin and I were discussing this room, I was beyond excited to see how it would all come together. Now that I have actually seen it, it's even cooler than I expected it to be. WOW. And as for the painting, Erin and her little one have the one-of-a-kind original painting, but a print version of this is now available in my Society6 shop! I LOVE creating a piece of art knowing that a little boy or girl will grow up with it hanging in their room. It seriously warms my heart. Now it's just a waiting game to see this beautiful baby girl!! Can't wait!!! So excited for you Erin! MISSY! You are so FREAKING talented! Of course Erin loved your work and commissioned a piece. I need to start having some babies so I can commission art too.